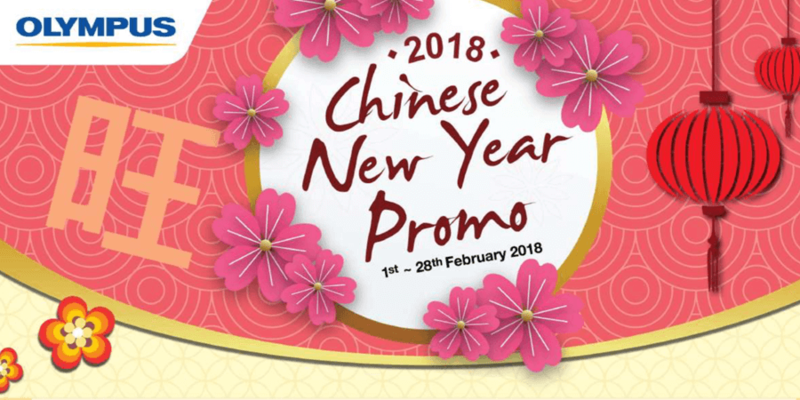 Upon purchase of the selected products, Customers must register the product within the time frame 12:00am on February 1st, 2018, to11:59pm on 7th March, 2018 for respective free gifts online redemption at https://goo.gl/rxHhuX. An email notification will be sent out immediately to acknowledge the received of customer&apos;s online submission. OMSB shall not be held liable or responsible for any failure or delay by the Customers in registering the product warranty and free gifts redemption during the Promotion Period. Customer is required to submit the copy of printed tax invoice, warranty card filled with customer detail (Customer Name & Customer Address), date of purchase and dealer stamp. Any incomplete detail upon submission will not be entertained. Customers with successful redemption will receive the free gifts by courier within 14 working days upon registration. Unsuccessful redemptions will receive e-mail notifications within 7 working days. The Free Gifts Redemption is not exchangeable for any form of cash or other products. Upon purchase of the selected products, Customers must register the product between 12:00am on February 1st, 2018, to 11:59pm on 7th March,2018 for the three (3) months extended e-warranty at <eshop.olympusimage.com.my>. 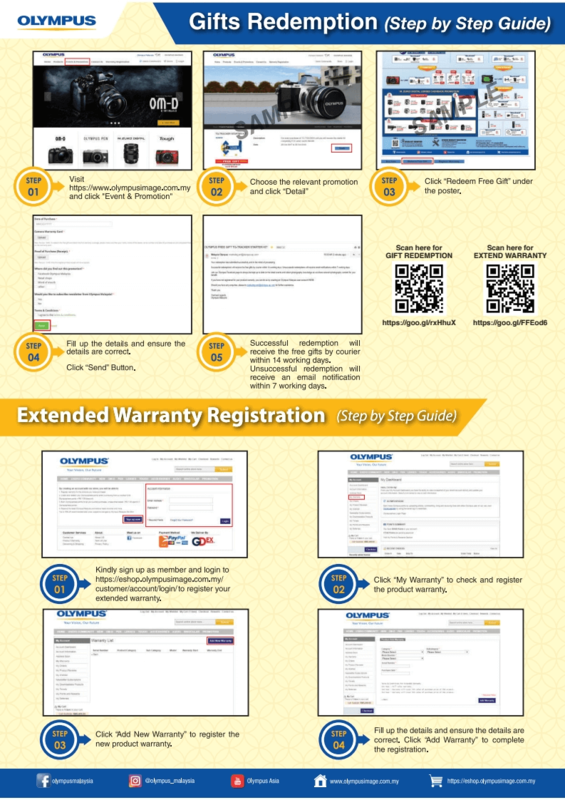 Successful registrants will be able to immediately view the extended e-warranty on the registration website dashboard. All 3-months Extended Warranty shall be registered by customer (not Investline Sdn Bhd) online. So kalau korang tak register, no free gift dan no extra 3-months warranty. This Promotion is organized by Olympus Malaysia Sdn Bhd (hereon referred as OMSB) and by participating in this promotion you are deemed to have agreed to be bound by the Terms and Conditions stated herein. This Promotion is valid to all Customers who have a permanent residential address in Malaysia as all redemptions will only be sent by courier to addresses within Malaysia. The Promotion period is from February 1st till 28th, 2018. 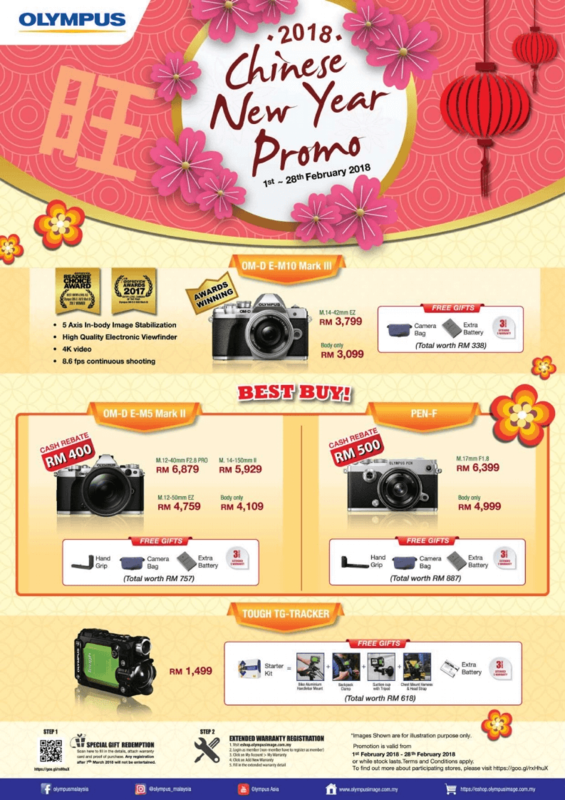 This Promotion is not valid in conjunction with any other promotion organized by OMSB. OMSB will not be responsible for the claims which have been delayed or not successfully registered due to whatsoever reasons during the promotion period. OMSB shall not be liable in any way to any person for any loss or damage arising from or in connection with this promotion. OMSB shall have the sole and absolute discretion to decide on all matters relating to or in connection with this Promotion (including but not limited to eligibility of this Promotion) and such decisions shall be final and binding on all Customers. OMSB shall not be obliged to enter into any correspondence with Customers on any matter concerning this promotion. OMSB may at any time at its sole and absolute discretion to terminate this Promotion or vary any of these Terms and Conditions without prior notice and without furnishing any reason. In the event of any inconsistency between the Terms and Conditions and any advertising, promotional, publicity and other material relating to or in connection with this Promotion, these Terms and Conditions shall prevail. These Terms and Conditions shall be governed by Malaysian laws and the Customers of this Promotion shall submit to the exclusive jurisdiction of Malaysian courts. Coverage provided under the Product Warranty is for repair and replacement of part(s)and component(s) in the event of product failure to operate as a result of Mechanical or electrical breakdown only. The 1 year Product Warranty Coverage are valid in Malaysia ONLY. The 3 Months Extended Warranty provide similar coverage as mentioned in the above. The Product Warranty, inclusive of the additional 3 months does not cover damages caused by water leakage and other instances caused by mishandling. Please refer to the Provisions of warranty stated in the warranty card for further clarification of the provisions of warranty that apply to the first year of warranty.